Synopsis: In a fortress-monastery on an island live the legendary warriors of the Nomana. No one knows the secret behind their power. Though there are three who are determined to find out...Seeker, Morning Star and the Wildman are about to become apprentice warriors. But their quest is interrupted when the mighty empire of Radiance threatens to annihilate the Nomana. Morning Star is kidnapped and about to be sacrificed. There will be grave consequences unless strong-willed Seeker and the brave, beautiful Wildman put aside their rivalry to rescue her. This is an epic fantasy of far-reaching significance. Seeker has always wanted to be a Noble Warrior: a monk who fights for Justice in the name of the All and Only. Morning Star and Wildman, too, wish to become Noble Warriors. All for very different reasons. But before they can join, they must prove themselves worthy. When Seeker finds a plot to destroy Anacrea, the Island on which the Noble Warriors live, he knows what he must do. He knows what he must do. Together with Morning Star and Wildman, he seizes his chance to show he is worthy of becoming one of them. 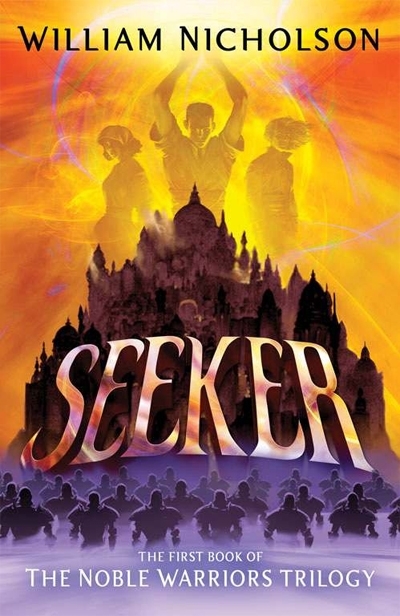 Seeker is the first book in William Nicholson’s second fantasy trilogy. Much like the Wind On Fire Trilogy, it seems that the Noble Warriors contains a host of fantastic characters, as well as a story that delivers a powerful message. William Nicholson has always been fantastic at realising characters in his stories; from writing fantasy trilogies to scripting Gladiator, his focus has always been on the characters, and how events around them will change them. Each of the characters in Seeker are original, and all feel so real and fleshed out. Seeker is a very character driven story, and Nicholson has done a great job at making the characters unique. To me, what makes Seeker such a character centered piece if story telling is the sense that William Nicholson didn’t write this novel because of the plot, but because of the journies all the characters undertake; it’s not just one or two of them; each person changes from beginning to end. Infact, I would go as far as to say that the reason there is a plot is so that it changes the characters, their morals and their ideas. Seeker was not written because Nicholson had a great plot in mind. It was written because Nicholson wanted to tell the changes a person undertakes to achieve their dreams, and what effects this has on the character. That isn’t to say the story isn’t good, though; quite the opposite: the story is fantastic, because of how it changes the characters. William Nicholson always writes many themes into his books, and Seeker is no different; love, forgiveness, deception, hate, courage, pain, longing, and anger are all covered. There is such a broad spectrum of emotions that if you named any one theme, you could probably find and identify it. When I first read Seeker, I was 12. I picked it up because I had read and loved the Wind On Fire Trilogy. Reading it again, I realise how much I just didn’t ‘get’; so much of the detail just passed through me. At the time, I thought much less of them, but now I can say I understand Seeker much more, and that I think the Noble Warriors Trilogy might just be my favourite trilogy of William Nicholson’s two. For that reason, I would say that you should read the Noble Warriors aged 14+, maybe even older. That’s just a general guidline, of course. Be inclined to take it which a pinch of salt. Seeker is a beautifully written and very powerful novel, boasting wonderful characters, a beatifully realised setting and covering some fantastic themes. It’s a book that will suit anyone, whether they like fantasy or not…in the end, Seeker is all about the characters, and in the end, the fantasy setting allows Nicholson to convey his thoughts. Be sure to read this book- no doubt it will touch your heart.